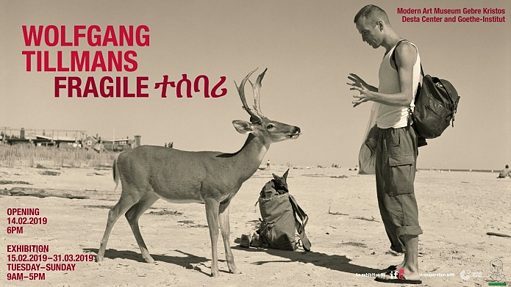 Exhibition "WOLFGANG TILLMANS: FRAGILE – ተሰባሪ"
African cities in the coming years. The work of Wolfgang Tillmans occupies a prominent position in the contemporary art world. Ever since his first exhibitions and publications in the early 1990s Tillmans’s artistic approaches have continually developed. He is constantly redefining photography both as an image and as a material artefact, be it in the museum space or as an object on the printed page. His work is based on his never-ceasing curiosity, his intensive research in preparation, and a constant testing and advancing of the medium and its technical and aesthetic potential. His visual language derives from precise observation that reveals a deeply human approach to the complexity of the world. Familiarity, empathy, friendship, and intimacy are all visible and tangible in his pictures. Tillmans’s approach can be seen as an appeal for freedom and an invitation to meet the other fearlessly and with open-minded curiosity. For Tillmans, acceptance of the fragility that determines us as individuals and that plays into our relations with each other is not a weakness – it is a great strength. Mistakes, ruptures and fragility are frequently impulses that lead to the development of new processes. They indicate the imperfection of our lives and yet also open up surprising perspectives on their material nature. Fragile provides a comprehensive overview of the many-facetted and different forms of artistic expression in the work of Wolfgang Tillmans, from large-scale prints to sculptural objects, video projections, and music, to his curatorial work in making the exhibition. This selection for this ifa touring exhibition comprises more than 200 works from 1986 to 2017. It includes framed and unframed photographs in various formats, and also his table installation truth study center, video works and numerous publication projects. Like all of Wolfgang Tillmans’s exhibitions, each venue of the tour will use an installation that reacts to the specifics of the exhibition space and its architecture and environment. The exhibition tour includes a catalogue in English and French, which will be complemented by a local contribution at each venue. Authors: Christine Eyene, N’Goné Fall, Bart van der Heide, Ashraf Jamal and Meskerem Assegued for Addis Ababa.